Most of us think that dust is a nuisance and spoils our home but a growing community of researchers believe that dust can be smart like a fully functioning computer. 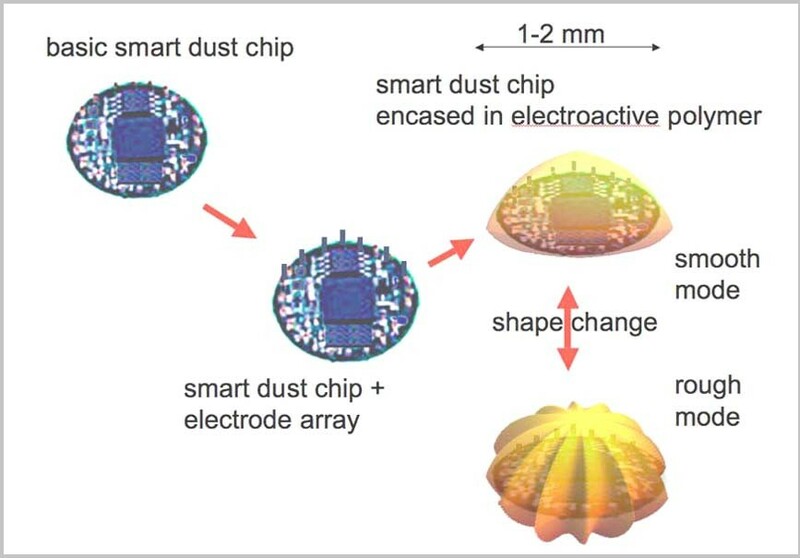 Smart dust is an emerging technology made up of tiny, wireless sensors or motes which are built into autonomous computing and communication systems packed into a cubic millimeter mote to form the basis of integrated, massively distributed sensor networks. This device is around the size of a grain of sand and will contain sensors, computational ability, bidirectional wireless communications, and power supply. While being inexpensive enough to deploy by the hundreds. Clouds of smart dust could be used in an astonishing array of applications, from following enemy troop movements to detecting toxic chemicals in the environment, building safety and automation, security systems and monitoring weather patterns around the globe. The current ultramodern technologies are focusing on automation and miniaturization. The decreasing computing device size, increased connectivity and enhanced interaction with the physical world have characterized computing history. The emergence of small computing elements, with sporadic connectivity and increased interaction with the environment, provides enriched opportunities to reshape interactions between people & computers and spur ubiquitous computing researches. Smart dust is a tiny electronic device designed to capture mountains of information about its surroundings while literally floating on air. If all of these are packed into a single tiny device, it can open up new dimensions in the field of communications. The smart dust package has the ability to sense & communicate and it is self-powered. The idea behind smart dust is to pack sophisticated sensors, tiny computers, and wireless communicators into a cubic millimeter mote to form the basis of integrated, massively distributed sensor networks. They will be light enough to remain suspended in the air for hours. As the motes drift on the wind, they can monitor the environment for light, sound, temperature, chemical composition and a wide range of other information, and beam that data back to the base station, miles away. A micro electro mechanical system consists of extremely tiny mechanical elements, often integrated together with electronic circuitry. Micro-Electro-Mechanical Systems (MEMS) is the integration of mechanical elements, sensors, actuators, and electronics on a common silicon substrate through microfabrication technology. The advantage of this manufacturing process is not simply that small structures can be achieved but also that thousands or even millions of system elements can be fabricated simultaneously. This allows systems to be both highly complex and extremely low-cost. Microelectronic integrated circuits can be thought of as the “brains” of a system and allow microsystems to sense and control the environment. Sensors gather information from the environment through measuring mechanical, thermal, biological, chemical, optical, and magnetic phenomena. The electronics then process the information derived from the sensors and through some decision making capability direct the actuators to respond by moving, positioning, regulating, and filtering, thereby controlling the environment for some desired purpose. The above diagram explains how a basic smart dust chip is embedded into to a device.